This week our friends at Democracy For America are announcing another round of winners for their Netroots Nation scholarship contest. If you weren't on the list of winners and you can't find the money/time/energy to get to Pittsburgh August 13 to 16 for the convention, don't despair...there is another way! 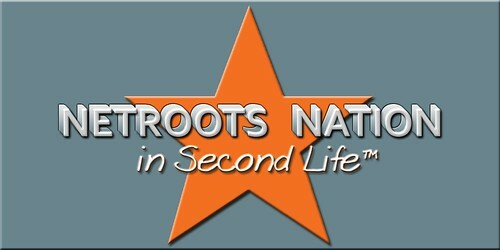 For the third year in a row we'll be taking advantage of the rich multimedia capabilities of Second Life to bring you live streaming audio and video from Netroots Nation right to your own computer monitor. Through Second Life we're able to bring you not only streaming video, but also real time discussion and participation in the panels from the comfort of your own home, exclusive online panels and information displays from nonprofit organizations, online retailers and great progressive companies. Oh, and did we mention it's free? Join us over the fold and we'll walk you through the particulars of how to participate and how to support our work with sponsorships. TABLE I: Concerning the summons to court. This should sound familiar, given what we have/have not seen in regards to summons and subpoenas in Washington of late. What would the Romans have said about Harriet Miers, and others? Law I. When anyone summons another before the tribunal of a judge, the latter must, without hesitation, immediately appear. This is the Very. First. Law. on the books. From this one law, all others are raised for without the summons being honored, there can be no consideration, ruling or application of law without the plaintiff and the defendant (most such cases as these were civil disputes, same as now) without the parties being present for an official proceeding. Otherwise, it's just vendetta, and there is no use to pretending that a viable civil society exists. ...and do it to the sound of madly cheering crowds. It will never be easier to remedy the Praetorian Presidency than now. It only seems dangerous and difficult now, because no one is thinking of how useless it would be to even try against even a mediocre occupant of the Oval Office. This being a response to Teacherken's DailyKos diary "acknowledging the important but often overlooked?". A few weeks ago, I wrote a piece that focused on the refusal of Monica Goodling, one of U.S. Attorney General Gonzales's staff to testify before Congress, a piece that turned into an exposition on what it was, that heretofore-nameless (for many) wrongness that pervades every Bush administration action, inaction, statement and silence. It's more precise than wrong, more slippery than crime, more tangible than evil. It's intentional tort or what the Romans once called delict, the wrongful act (as in in flagrante delicto). Today, inspired by a great educator who just happens to be very "toonagenic", I write what I'd like to do, and help the American (and every other) society do: Leave the world a better place than it was the day before. US Mideast Allies Bailing, Big Time. RIYADH, March 28 -- The king of Saudi Arabia, King Abdullah, condemned the presence of American forces in Iraq as an "illegitimate foreign occupation" in a speech today, and said the withholding of aid to Palestinians should end. The king's speech, at the opening of the Arab League summit here, appeared to distance his country's position from that of the United States. Saudi Arabia has been a powerful Arab ally to the United States in the Persian Gulf region. Oh, it gets better. Lots better. Leaving the United States out of it. For some reason, it's a lot simpler a plan to execute, and a lot less violent. It's just...a lot less American. I hope this says more about the particulars of the situation than about the United States, but ...well, if I can get over my hang-ups in a day, perhaps there's hope for Humanity yet. The new! improved! plan below the break. Given how suddenly events are changing in Iraq, it's time to wrap this short series up. Part One raised the point that the very premise of the Baker Commission -- that Americans retain some control over events in Iraq -- was rapidly going out of date. By the time I published Part Two the preferred scenario from work in support of the Baker Commission was egregiously unsuitable; this was demonstrated. Today, we'll cover the less palatable possibilities. The ones that are happening right now. Alan Schwartz's "Scenarios for the Insurgency in Iraq" provides a discussion of five likely scenarios for Iraq. The work is likely to be part of what the Iraq Study Group is using to formulate its advisements to the Bush Administration. Britain, Turkey, Iran, and Syria top the list of actors who are not waiting on James Baker III for marching orders. ...all the usual suspects (Turkey, Iran, Syria) are pushing for closer ties to the Iraqi central government. These efforts are far along. Cross-posted in Garish DKOS Orange We're probably not going to get the Baker Report for a while. However, that's no reason not to take a peek at the working papers being used by the think tank that's feeding the Baker Commission its information. Alan Schwartz's "Scenarios for the Insurgency in Iraq" is done for United States Institute of Peace, which happens to be the institution backing up the Iraq Study Group. ...The commission is headed by former Secretary of State James A. Baker, III, a close friend of the Bush family, and former Indiana Democratic Congressman Lee Hamilton, who also cochaired the 9/11 Commission, and is being coordinated through the United States Institute of Peace (USIP), a government-funded think tank. Oil and Water and Warming and War and...Whew! I'd started this out as a post to London Yank's diary on Iran...and, being me, it got a bit out of control. Plus, as the grand finale, a grave concern that humans aren't that patient and as likely as not will simply make war after devastating war until the numbers are diminished to the point that while Earth might outlast us, even if some humans persist they will be hapless creatures and everything we think of as wonderful and worthy of our self-preservation will die even if we do not. Two years ago, I started a short series of diaries on the apparent relationship between countries with rapidly-diminishing water resources and their likelihood in a given historical period to be either at war, or near war, or at risk of one or both. The first cut defined, more or less, the theater of conflict for the so-called Global War on Terror. At which point, I became confident in applying the same method as a forecasting tool, the results of which suggested that even if there is no significant degradation in the global environment, this was going to be a rough century. Two years later, I revisited the speculative findings, by checking on developments, with a particular interest in areas I'd not seen as having ongoing war issues at the time. Oops. A lot of them did then, and those that did not do now. The relationship is even stronger than I realized. Perhaps you’ve heard of the recent unpleasantness between The Russian Federation and the Republic of Georgia. A fine diary touched on this topic yesterday, and I invite all of you to check out allmost liberal europeans’s most excellent work. No doubt, Georgia’s a flashpoint. So is the entirety of Central Asia, from the Transcaucasus Region to western China. It's center stage for the next world war...and more than one side is starting to get prepared for what is not an inevitable showdown, so much as one that at least one side and perhaps both are determined to have. American force projection into Central Asia and the Middle East is better-known; much of what I focus on here is what you never hear about: What the Russians are doing. Answer: A lot more than you'd like to know about. So, take a deep breath, and....dive!!!! So often, we talk of hope in very general, well-meaning, global terms. Hope, though, is far more personal than that. Hope is borne not so much of strength but a last stand against succumbing to despair. And that is the paradox; for the thing that is strongest when we are not is what so often carries the day. So, what is this `hope thing', anyway? The way I see it, hope is the combination of yearning for remedy and the confidence (call it faith; I do) that it will be delivered. That we truly are coming to the end of the world as we know it, and saying "I feel fine!" about it is unacceptable. ***A Week Ago, The Cedar Revolution Was Righteous. Short form: This week, we saw a representative democracy launch a massive attack against another representative democracy, with no warning whatsoever. The justification, if I've got this right: Hizbollah attacks Israel from Lebanese territory, Lebanon does nothing to stop this, Israel's not going to put up with either Hizbollah or Lebanese longstanding unconcern for Israel's complaints, and that's why Lebanon is getting punished. And besides, everyone knows (sic) that Lebanon's not really a democracy anyway. Funny thing...that's not what people said as late as a week ago. On account this is at the heart of all matters related to both the conduct of American foreign policy, and the worldwide reaction to it, and why so much room has been given to the Bush administration to diverge from democratic norms, on the premise that at the heart of it all, the United States of America has, is and always will be a free society. Why this credit card has been accepted by the powers of the planet for so long is precisely the topic of discussion here. We cover a lot of political theory, here. It's tangentially related to the diary about the US-Israel alliance. It is, ultimately, a far more important topic. To walk away stunned, even floored, is not the intended effect. It is the only possible effect. Saddle up. Lock and load, and learn something about why you love freedom and trust strangers in foreign lands with yours more than your own government, because a man figured out exactly why over two hundred years ago. I'm blissfully ignorant of the particulars of the recent Walt/Mearsheimer paper casting aspersions on the extant US-Israeli alliance. Nevertheless, I felt compelled to weigh in on the general topic. Being something of a number-cruncher with some test models on the alliance-forming tendencies of states (I've posted diaries on this in the distant past), I thought I'd give it a go....for better or worse. Though I have a penchant for steering clear of the hot topics, I thought I'd break with tradition and jump right into the deep end of the pool today. Abstract just below the break. Frontpaged by Sirocco, with one typo corrected. In the years discussed here, we see the transformation of Earth from the center of the Human attention span to a place that an increasing portion of Humanity wishes would just go away. There is a Canadian Civil War. There is a World War III. There is an invasion by Mars (but they're US allies at the time, so it's cool). An alliance between Russia and America to win World War III. An alliance that breaks up over religious extremism: the Russians buy into a new movemen, we don't and that's all she wrote. The Russians then become pals with the Brazilian Empire and attempt a tag-team genocide on the few remaining inhabitants of the Middle East and North Africa (what sweeties). For some reason the now-leading Islamic powers of Southeast Asia object, call for backup from Muslim-friendly Callisto, and World War IV starts. The Martians, now the dominant player in the production, intervene before a 'solar war' flares up, and we end the story with the top three major powers of Humanity being the Martian Synthe, the Asteroid Combine and the Europan Union, and Earth falling into reaction and a new form of chauvinism as a result of this upturning of its accustomed primacy. Given the headline story (Stanislav Lem), I figured I would share the first, oh, nine hundred years of my own future history (in two parts) with you folks here at Eurotrib. Migeru suggested I re-post an old comment of mine from Dailykos, and share it with our friends in progress across the Atlantic. Short form: The economy is going to change basis from petroleum to...something else. The question is whether that basis is post-petroleum...or pre-historic. There may well be no in-between.